The amount of protein necessary and optimal is debated amongst health experts. While the official DRI (daily recommended intake) is set at 0.36 grams per pound of body weight (or 0.8 grams per kilogram), many professionals would say this is on the lower side. In reality, the perfect protein intake (somewhat) depends on the individual, as every person is biochemically individual, and the same diet that works for one might not work for another. In fact, this rule doesn’t just apply to protein, but with most aspects of what a healthy diet should consist of. For example, some people might thrive on and need a high protein diet, while others actually don’t do as well consuming that much protein. Factors that influence this include activity level, gender, genes and age. Why Is Protein So Important, Anyway? Again, check out our in depth article on protein here to learn more, but here’s a quick recap. Protein is the building blocks for all of you cells, muscles and tissues. Without it (or enough of it) you health can truly suffer, not to mention your body composition (fat vs. muscle mass). Because protein is the building blocks of our muscles, if you are particularly active you’ll require more protein. Several studies have shown that eating a high protein diet can increase strength and muscle mass (2), and this especially goes for athletes or those who have a naturally active day job. If you workout hard and don’t get enough protein, you will lose muscle instead of building it (generally, not the point). Studies show that a diet higher in protein, lower in carbohydrates (especially refined carbs) and moderate in good fats is the most effective way to lose weight. One major reason for this is that protein’s thermic effect (the rate at which it increases your metabolism) is surprisingly higher than both carbs and fats. Protein boosts our metabolism by 25-35%, while fat and carbs come in around 5-15% (3). Not only is this crucial if you have a major metabolic disorder (like Diabetes, for example), but it also extremely important for anyone needing to achieve more balanced blood sugar levels (and let’s face it, most people who eat a conventional diet that is high in refined carbohydrates fall into this category). High protein, low carbohydrate diets have been shown to be the dietary method of managing diabetes (4). Who Needs To Eat More Protein? All athletes, but perhaps even more so, endurance athletes, will need to up their protein intake. Consider that muscles are made largely of protein, and in order to build muscle mass, you must be synthesizing more protein in the muscles than you are breaking down. So, even if your end goal is not to put on a ton of muscle mass (but definitely also if it is), you must be sure to get enough protein so that your training is not actually breaking down muscle. A high protein diet is proven to both build and maintain muscle mass (5). The most common recommendation for athletes or anyone fitting into this category is 1 gram of protein per pound of bodyweight, or 2.2 grams per kilogram. However, if your goal is to lose weight, calculate your protein intake by your ideal weight, not your actual weight. For similar reasons to those who are exercising/training hard, those who are constantly walking around, lifting heavy things or doing other types of physically demanding work day in and day out will probably need to up their protein content. It does not need to increase as much as a serious athlete, necessarily, but somewhere in between the DRI of 0.35 grams per pound and 1 gram per pound will be enough. Most elderly people will truly benefit from an increased protein intake. In fact, this has been shown to help prevent common and debilitating conditions like osteoporosis and sarcopenia (loss of muscle mass). Many experts say up to 0.5-0.6 grams of protein per pound of body weight. Those with Diabetes or other blood sugar conditions will want to increase their protein intake while decreasing their carbohydrate intake, and being sure to get plenty of good fats. Depending on your specific condition, this should be discussed with your doctor. If you are at a healthy weight (not looking to gain or lose), don’t exercise much or lift weights or fit into any of the other categories mentioned above, you are probably fine sticking with the DRI of 0.35 grams per pound of body weight. For an average man this would be approximately 55-90 grams per day, and for an average women would be 45-75 grams per day. This is actually a quite common mistake. Grams of protein refers to the actual amount of the macronutrient, protein, in a certain food. For example, an egg weighs about 50 grams, but contains 7 grams of protein. This is the number per pound you should be looking at (7 grams) when determining your protein requirements, not the weight of the food itself, in grams. Are There Any Dangers In Eating Too Much Or Too Little Protein? Unless you have a pre-existing kidney condition, studies show that a moderate to (reasonably) high protein diet will not have negative effects on your kidneys (6). 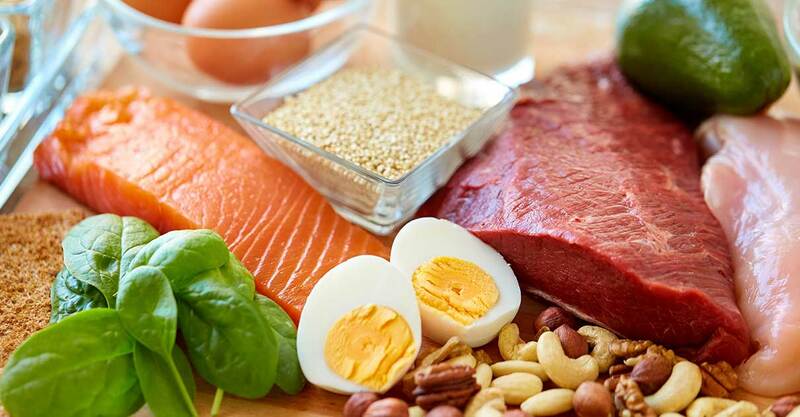 Protein deficiency, on the other hand, can cause a myriad of problems such as breakdown of muscle, improper organ function, lowered immune health, fatigue, greater risk of injury and more. Getting enough protein in the diet it serious business. Unless you are a professional athlete or have another determined reason with a professional for counting daily protein intake, you probably don’t need to count your protein grams on a daily basis. With that said, counting for a few days just to get an idea of how much you are eating could be helpful. If you include protein rich foods like grass fed beef, wild fish, organic poultry, pasture raised pork and eggs and whole dairy on a regular basis, you are probably fine. Vegetarians and (especially) vegans will need to pay closer attention and be sure they are meeting their body’s protein requirements, as deficiency in these populations is more common. Check out our article on the 10 best high protein foods to incorporate in your diet.